10. My trip to Cape Town: Mountains, Ocean, Beaches, Penguins…awesome! 9. Grocery shopping with Rishelle for Teen Mania. 500 loaves of bread, kg’s and kg’s of rice, mealie-pap, and lots and lots of shopping carts. We had some great laughs. 8. Safari’s: elephants, lions, giraffes, zebras…I never get tired of seeing these amazing creatures. 7. Easter Conference in Namibia: traveling with youth on a mission trip…you’re only asking for awesome memories there. 6. The houseworkers asking for Bible’s: I will never forget the look on their faces and the bond we experienced that day. 5. Hungry, Hungry Hippos: If you don’t remember the story, click here. Personally, I will NEVER forget it! 4. My time at the Refugee Camp in Dukwe: It was my first experience at a Refugee camp, and one that changed my heart for refugees. 2. Rat in the gastank: This has to be one of the all time great stories of breakdowns. 1. Samaritan’s Purse Day: An image that will stay with me forever. Seeing thousands of kids opening up their shoeboxes filled with small tokens and the smiles on their faces. Priceless! The day before Reg was leaving to return back home, we decided to brave a road trip out to Moremi Game Reserve. It is only about 1 hour north of us, which makes it easy to drive early in the morning and return that evening. We left at 6am (a bit too early for either of us), but decided that we wanted to make the most of it. Now let me start by saying that it has been raining almost everyday since December here, and we knew that going in. We were pretty confident in our 4-wheel drive R2! About 7am we arrived, and 7:30-ish we were stuck! I am not going to go into details as how it happened (if you want the True, Hollywood story you’ll have to ask Reg. ), but I well say this….it was a complete disaster! As you can see from the picture below, the left side of the car was completely buried in mud…tires and all. The only saving grace was the right, front tire, which was luckily wedged on a ledge. The rest of the vehicle was sinking. Water began coming in the passenger side of the car, and even my 4-wheel drive couldn’t get us out of this one. We were stuck….and good! Here’s the other kicker about our situation….we are in an area where we cannot get out of the car and go for help….we’re in the middle of the Reserve. There was no telling what we would come across out there. We also couldn’t call for help…there is absolutely no phone service….we are literally out in the middle of nowhere. So, as much as we did NOT want to do this, the only thing we could do was just sit and wait. It was now 8am and we knew that the only person who would come looking for us was Michael, who wouldn’t even begin to worry unless we didn’t show up that evening for our Friday night Nacho Libre festa. At 8:15 (only 15 minutes of waiting, mind you) we were already going out of our minds. How were we going to last an entire day or night in this state? We both agreed that the only thing we could actively do is pray, so we got to it. And here is how God works…..
8:30: A vehicle approaches. It is a wildlife protection vehicle, and they are more than willing to tow us out. They attach a tow to the back and begin pulling, but my car was not budging. We then decide to pull it from the front, and still nothing was working. My little R2 was just a bit more powerful than their OLD LandRover. But, after a bit more work, and lots of spurting mud, we finally were out! I can honestly say that I have never been so happy to be able to drive again! We decided to keep on going, figuring the worst was behind us now. Needless to say, after many heart-stopping moments of driving through puddles covering the entire road, not knowing if we would make it through, we finally gave up. Our hearts could not take any more of the stress and anxiety involved in this endevour. Reg: Will there ever be a day when we travel together and NOTHING happens? This weekend I took Jodi to Namibia for safari. We had a great time. The place we stayed at is right on the Okavango Delta, so the first night we took a boat ride down the river. 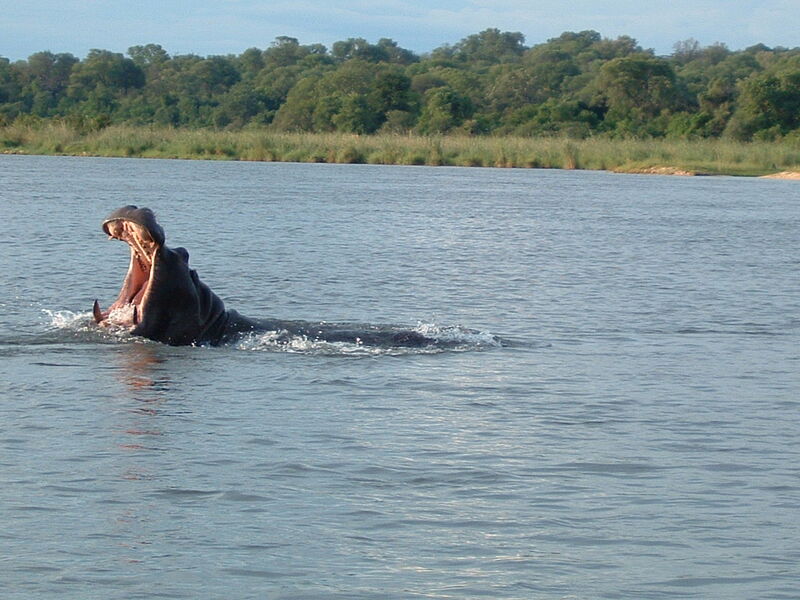 We saw tons of hippos, and I was so excited to finally get a picture of a hippo with his mouth open. It is incredible how huge these animals are and when they open their mouths wide, you realize how powerful as well. The teeth are like spears! Its just spectacular! We also took a drive safari and saw all kinds of animals…it was a joyous time, and a nice break away from the everyday work at the mission.